Are you wanting to cross a river, a ravine, a highway....? Here are a couple of shots of bridges on my layout. I had a few bridges on this first layout of mine,...the Atlas Plan 'Central Midland"
Obviously I like bridges on my layout. Did you count the number I have there?....and only two of them are the same....the 2 modified Atlas Curved-Cord bridges. Several of my bridges were not really bridges in the truest sense,.... they didn't have their bottom structures. Both of these were the double-track bridges that I kit-bashed from single-track Atlas/Roco Curved Cord Bridge kits. I simply took two single track bridge kits and 'doubled' the upper connecting beam structure to effectively provide for a dbl track spacing between the curved cord beam structures. I left the bottoms out (to be used on other projects*), and just relied on the roadbed to provide support for the track of the bridge. I glued four 'locating pins' onto the corners of the curved cord sides, and these plugged into 4 holes drilled into the plywood roadbed. This kept the 'bridge' properly located, and its side frames properly spaced apart such as to not interfere with the passing trains. 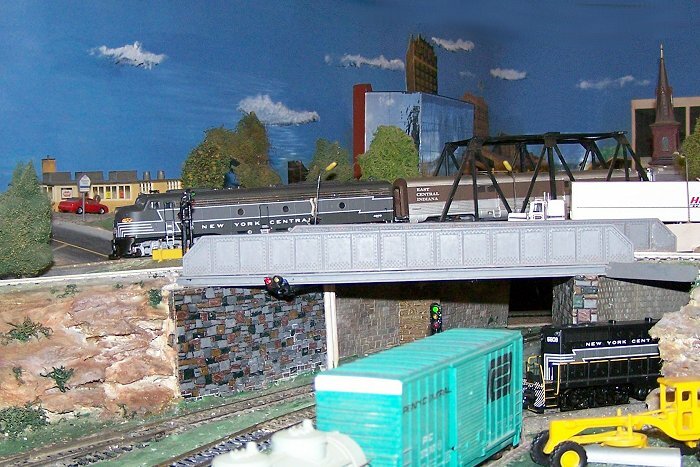 One of these dbl track bridges was set up as a safety device,....that one against the backside of the layout right at the point of the crossover switching between the 2 mainlines. I had in the past experienced several of my nice steam engines derailing and crashing off the layout onto the concrete floor...NOT a pleasant experience!! I decided I was going to put up this bridge structure to prevent any derailed loco from experiencing that fall off the side. Strange as it might seem, after I put this 'guard-rail bridge' into place. I hardly ever experienced any other derailments ?? That 'fake bridge' precipitated the idea of a stream/river running under it and out into the 'country backdrop'. It also meant I have to have another bridge for the inner track,....thus the 'deckbridge' to allow for variety. The other 'fake bridge' came about as a result of my adding the Walther's double track truss bridge for the dual tracks I wanted to have enter into the turntable zone. Since I had that bridge actually spanning the lower tracks, its only naturally the my yard entrance tracks would also be spanning those mainlines below. The 'fake double chord bridge' was the easiest way to do this without tearing out the subroadbed and replacing it with an actual real bridge. Besides with all the ballast, and cinders, etc in this yard area, no one would ever tell there was no bottom on that bridge. I also had to pay particular attention to the exact location of those bridge side frames so as to not interfere with the swinging passenger cars and articulated Big Boy loco that would come thru that trackage. The Louisville Railroad has three bridges. A ballasted deck trestle (not finished yet), a plate girder deck combination, and a truss. The dry gulch. Obviously need to get the support legs in. They will be iron legs on cement footings. The bridge is just 3/4" plywood with the plates glued to the sides. The "shadow" under the bridge is not a shadow at all, it is painted. Three span 30' deck plate girder, 70' through plate girder, and another 30' deck. These are all part of the Walther's bridge engineering series. Obviously need to get the guard rails in. And finally a through truss. Also still needing guard rails. Here's a few shots of a curved bridge that I had to stick build. Prototype railroads would probably never have a curved bridge but I needed one on my layout. This is a totally bogus scene. The backdrop is real, and imaged faithfully by the camera, but so is the HO scale diorama in the foreground. I used image-stacking to get it all in focus, and then used a cloning brush to brush in the steam and smoke effects. Here is a trestle scene I had on my previous layout. I suppose this would be considered a bridge. My train but not my bridge.Friend of mine module for our club layout. Tom, Now that's an impressive bridge! So's the train. He's got the patience and a love for bridges.It's a copy for a pic just can't remember where.I believe they're Micro Engineering trusses. Not knowing what it is the O.P. wanted his bridge to cross, here are a couple bridges using the Atlas Deck Truss Bridge. The back bridge is the Atlas Bridge's as designed length. The bridge in the foreground is two Atlas Deck Truss Bridges spliced together. Here are three bridges crossing a small stream. The top is a Trestle kit made by Campbell's It is actually their straight Trestle kit, built with a radius. The next bridge below the trestle is two girders from an atlas Through Girder bridge where I cut the Girders off the bridge and installed them under the track and added Code 70 guide rails and outside wood guides. You can see that it did not use bridge track as the ties are separated the standard distance. The third bridge is an Atlas Through Truss bridge, built per the Atlas Design. All bridges have been weathered to look like they've been out in the weather for years. 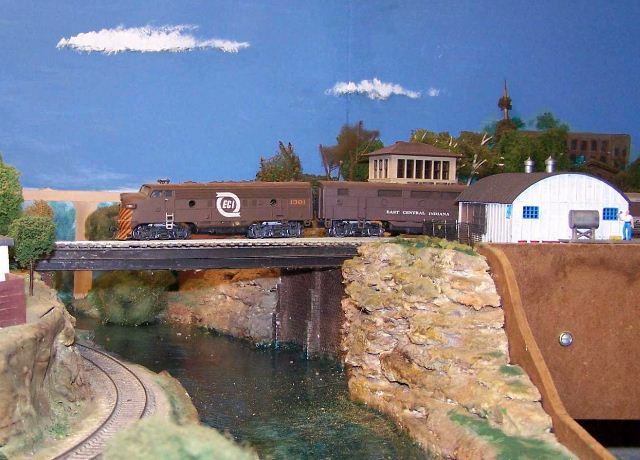 This last bridge crosses my HooDoo Gulch on my Northern Pacific Layout. It is Scratch Built from 1/8th inch diameter dowels and Balsa Strips. The abutments are AIM Products and the through Girder end is an Atlas product. This trestle is not completely straight, the right end has a slight curve to it. Having been an Radio Control Airplane Modeler for many years, this stick built trestle model was right in my wheelhouse! It used a code 83 Micro Engineering Bridge Track with code 70 guard rails and I had to use two Code 100 to Code 83 transition tracks on each approach end. I found building and kit bashing my bridges to be loads of fun! Everyone has done very impressive work! I love bridges of all kinds. My O.P was just to get some ideas going. I WANT to utilize some bridges but not sure where/how. Some redesign of layout is probably in store. If you can tell, I really like Trestles. I like building them and installing them on my layout. Sweet-Chuck, it might take some redesign of your layout; but, will be worth it to include bridges. I have nine of them on my layout. Bridges (where/how) is decided by the need to cross over something; water, highway, RR tracks, other. Good luck and have fun! Thanks for the photos all-I have one in bridge place, have a location for a viaduct, and am just trying to get inspiration for how to incorporate at least one more. I really want one that crosses over track-it has a very specific element to me that shows depth and action on a layout. I may have a project though rerouting track AND dealing with clearance/incline to do so. Right now I am working on getting my bus and feeders completed and will take a break from anything major to just play with trains for a while and mess around with building placement and sidings.